Hotel guests want quiet in their rooms. If they hear traffic or pedestrians or noise from a neighboring restaurant, it’s a negative – and they remember it. They’ll even knock stars off an online review after a bad night’s sleep. Fortunately, there’s an easy way to accomplish hotel soundproofing against outside noise without replacing the windows. Improved guest comfort and satisfaction ratings so you rank above your competitors. No revenue lost during the 10-minute installation of each insert. How much hotel window noise reduction can you expect? A lot. Standard grade inserts block up to 50 percent of sound coming through single-pane windows. Acoustic Grade window inserts do even better, blocking up to 70 percent. 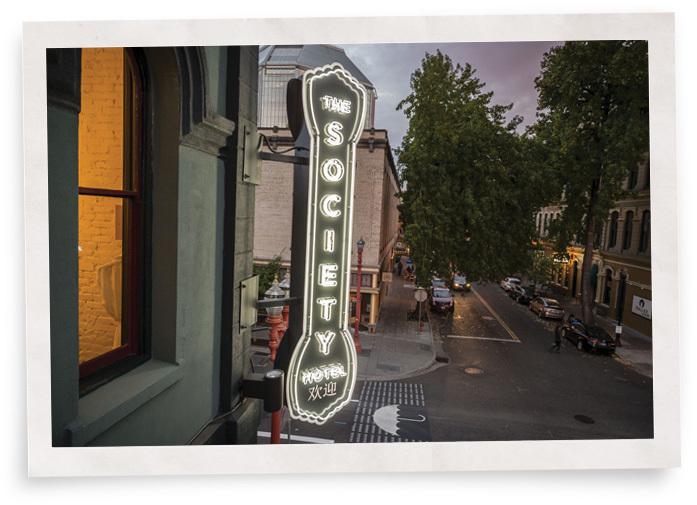 They reduce voices on the street, loud traffic as well as music and noise from neighboring businesses. 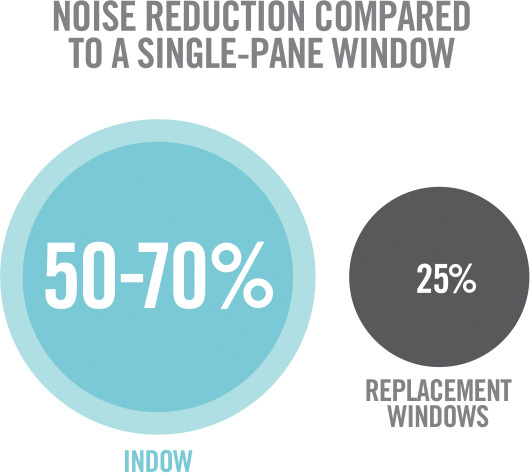 Indow window inserts reduce noise coming through single-pane windows by up to 70%. Replacement windows typically reduce it by only 25%. Plus, the installation process is much more disruptive. 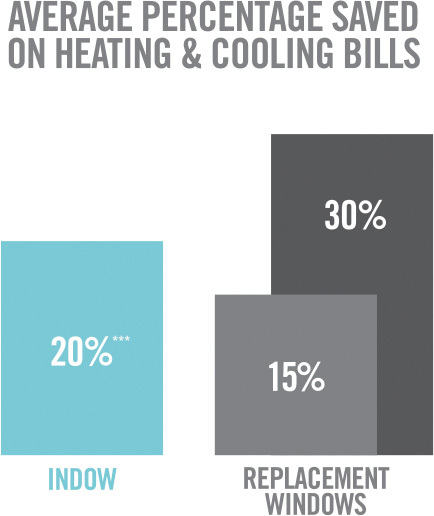 A U.S. Department of Energy study found that installing Indow inserts reduced heating, ventilating and air-conditioning use in a Seattle home by 20 percent. A study by Portland State University’s Green Building Research Lab found similar results. You’ll begin saving money immediately on your hotel’s energy bills. And you have bragging rights since Indow window inserts help you reach your sustainability goals by increasing energy efficiency! No Construction: Rooms Stay in Service. Replacing windows requires you to close rooms during the construction process. Indow inserts are edged in our patented silicone compression tube and simply press into the interior of existing window frames. They take 10 minutes to install, which can be done while you’re getting the room ready for the next guest. Also, unlike some window products, they don’t require a damaging track or magnetic system. Nothing is bolted to the walls. They also come in a variety of tubing colors to blend with existing window frames. Now that’s hotel noise reduction made easy! We work with you to understand how noise enters your space, how your guests interact with your windows, and what the process will look like to install large orders. 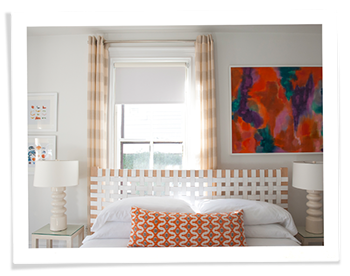 You can start with a pilot room or we can easily estimate the cost of outfitting your hotel with Indow window inserts based on the basic width and height dimensions of your windows. Mullions can be used to segment inserts for especially large windows. Please contact us for a free consultation on how to quickly create a more comfortable, sustainable hotel! Free estimates based on the width and height of your windows. Actual laser measurement scheduled for your convenience. Inserts shipped directly to you 3-5 weeks after ordering. *Note, overall noise reduction performance depends on how much noise is coming through walls, ceilings, floor, and doors. The window noise reduction will be less when Indow inserts are placed over double-pane windows. We do not recommend Indow inserts for reducing noise coming through laminated glass windows, triple-pane windows or hurricane windows.